This exterior five panel Southwest-style wooden door has one panel at the top of the door that is the same size as the four panels below the mid rail. In each of the top panel's four corners is a raised, carved fan design. The fans' "handles" are nestled in the corners of the panel. In the center of the panel is a raised square with its corners pointed toward to the top, bottom and sides of the door. In the center of that square is a carved flower. The four panels in the lower half of the door are all equal sized. In the center of each is a raised rectangle, but no additional decoration. The door is finished in a flat turquoise enamel. 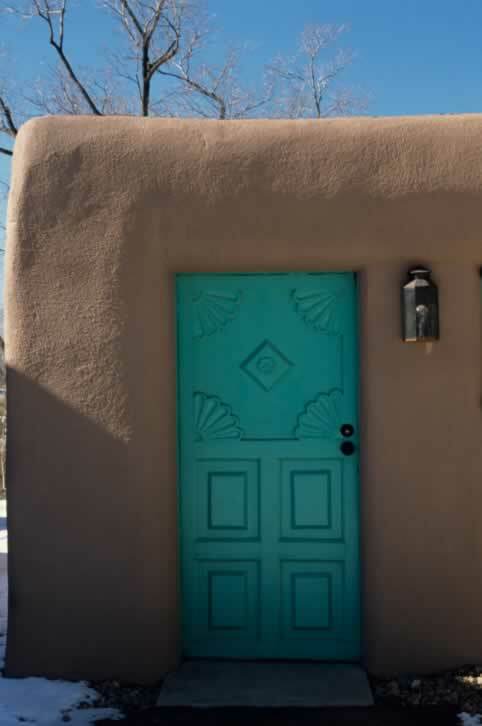 The door's stile, jambs, and sill are also painted turquoise. A black metal latch and knob are the only visible hardware.